I’ve been involved in organizing boat trips and adventure tourism for 20 years. I don’t think there’s a boat left that I haven’t used to entertain tourists! Just about everything that floats has been pressed into service by us at some point – canoes, kayaks, rafts, yachts, SUPs, river catamarans, floating saunas, RIBs, amphibious ATVs… you name it! We’ve traversed every possible waterway from bog lakes and rapids to the open sea. I’ve gotten a good idea of tourists’ preferences (and the way they’ve changed) over the last two decades. People these days are in a hurry. Boat trips used to last an entire day; now they want them done and dusted in just a few hours, sometimes no more than one, before they move on to the next thing on their to-do list. That said, sights – whether the stunning natural environment or beautiful city views – are still important to them, of course. But everyone’s got a schedule these days, and they’re invariably full. If only they could experience the thrill of it all and admire all the views in half the time… And they can! Tourists can maximise their experience by taking a trip on a speedboat where the package covers everything. Young people today just don’t have the patience to while away hours enjoying the scenery at a snail’s pace. The views alone aren’t enough to tempt them: you need to offer speed, excitement, an adrenaline rush, albeit within the bounds of safety. And without prying them away from the bosom of civilisation for more than an hour or two. Waves crashing on the open sea are something they’d much rather watch on their smartphones in any case. All of this led me to the conclusion that the perfect boat for what we wanted to do didn’t exist: we needed to build it ourselves. 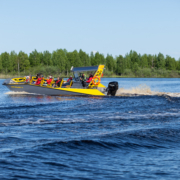 We needed a boat that could handle large groups at high speeds in shallow waters both securely and comfortably; one that looked so cool that it would be a total selfie magnet. I picked the brains of loads of people, including the best boat designer I know and some amazing aluminium boat builders. And voila! Together we came up with the WaterMate LR9, the perfect vehicle for tourists with busy schedules. Having said that, it’s also ideal for diving, snorkelling and fishing, or even for cargo. The model that comes with a cabin could be used by a variety of agencies for inland water patrols, too.